This could be OnePlus’s moment. Back in June, the Oppo-backed Chinese smartphone maker announced that it had sold one million units of its latest handset in 22 days. These aren’t Apple or Samsung numbers we’re talking about here, of course. But they’re impressive for a less than five-year-old company odds are pretty good you’ve never even heard of. And in a sense, it’s precisely Apple and Samsung that have indirectly driven that growth. Over the past few generations, the leading handset manufacturers have made $1,000+ flagships routine. OnePlus, meanwhile, has remained steadfast, clinging to a “Never Settle” slogan that’s less about grasping for the latest innovation than it is embracing the whole picture. It’s a motto that, ironically, sometimes means settling for slightly behind the curve. But it’s the same smartphone war that’s pushing innovation that is also driving up price tags and incentivizing companies to adopt technologies that aren’t quite ready for prime time. 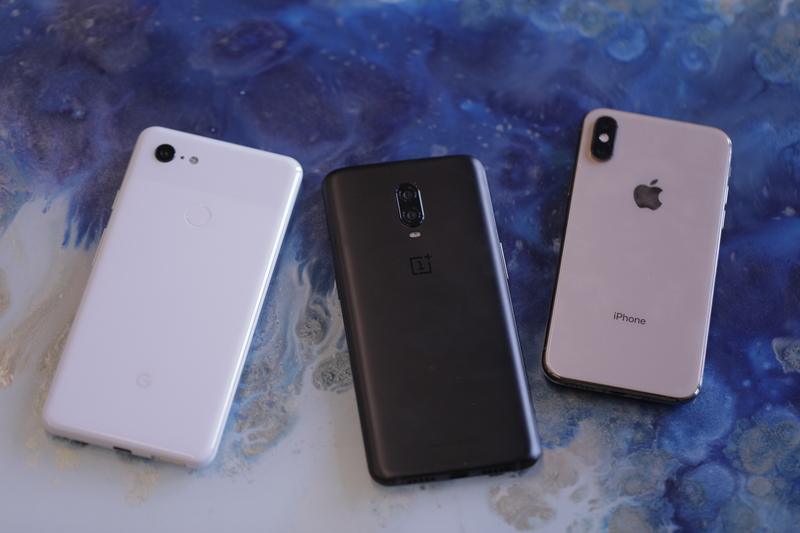 OnePlus’s approach, meanwhile, has allowed the company to offer remarkable consistency since pretty much day one — and to do so at a price that’s near half that of high-end competitors. That holds for the new 6T, which starts at $549. That’s $20 more than where the OnePlus 6 started, mind, but that’s largely due to the decision to drop the low-end 64GB model and start things at 128GB. Likely there will be some who balk at that small choice. And $20 is $20, certainly, but as far as growing pains go, it’s a pretty small one. That said, the company does find itself making some uncharacteristic decisions as it edges toward its fifth birthday. The first seemed like an inevitability, with the company finally settling down with a carrier partner here in the States. The Magenta carrier seems like a strange partner, perhaps, at first glance. “We found a kindred spirit with T-Mobile,” the company writes in the attached press release. The simple fact of the matter, however, is that you still need carriers to grow here in the States. OnePlus is, naturally, looking to do that here — but it’s trying to do so at a measured pace. It’s an admirable approach in an industry where the majority of companies are more interested in growing as quickly as possible, often sacrificing things like quality and customer service in the process. It’s been a part of OnePlus’s approach from the beginning, through things like its invite-only releases dating back to the early days. Assuming the company’s backers continue to be on-board with the approach, good on it. There’s another key flank to the company’s new approach. If you’ve heard anything about the OnePlus 6T up to this point, it’s probably this about this. 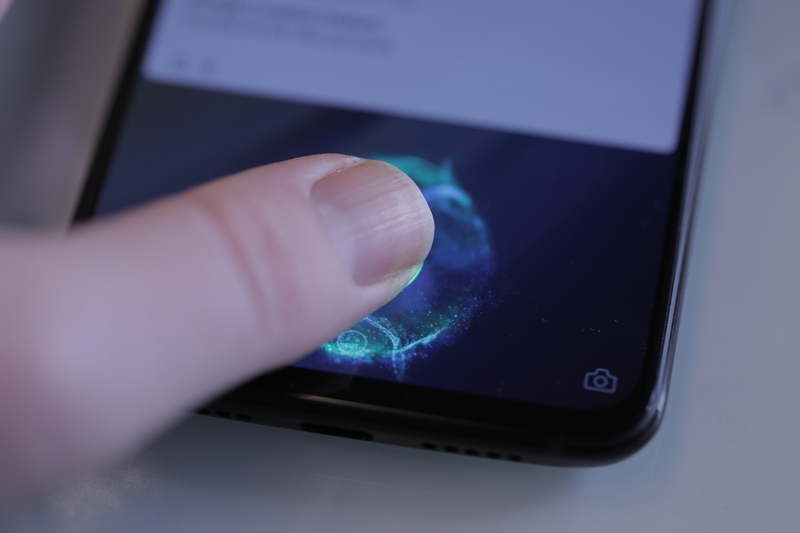 The handset is one of the first to hit the U.S. market sporting an in-screen fingerprint reader, beating the Samsung Galaxy S10 by several months. 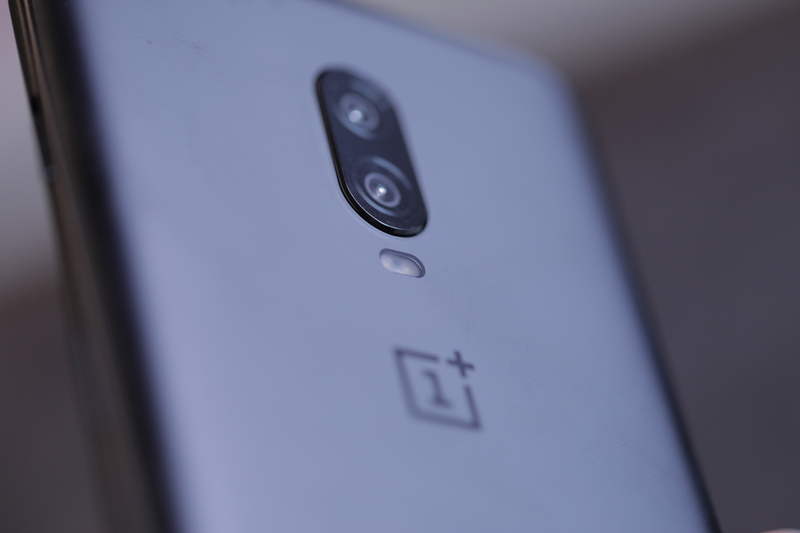 We’ve seen some international handsets sport some version of the technology, but this is a win for OnePlus and a change of pace for the company. Among other things, it’s a way to stand out from the crowd. In a perfect world, building a solid product for a good price would be more than enough, but perfect this world isn’t. Turn on your TV for like 10 seconds (I’ll wait). It’s a novelty, for sure, but it’s one that makes sense in the broader context of the phone. OnePlus has had face unlock for a while, but it’s a less secure version than the one found on the iPhone, which means you’ll want a second layer of security on the device. Adding a module beneath the screen brings the authentication back to the front of the device without having to increase the footprint or sacrificing precious screen space. It also comes with the added bonus of being able to check your phone without having to lift it up to your face — one of the main annoyances of Apple’s Face ID feature. The feature works fairly well. When the screen is locked, a fingerprint icon pops up, showing you where to press. When the finger is in the right spot, the AMOLED display flashes a bright light to capture a scan of the surface from the reflected light. The company says it takes around a third of a second, though in my own testing, that number was closer to one second or sometimes longer as I negotiated my thumb into the right spot. Perhaps, unsurprisingly, the addition comes with a compromise. In order to fit the scanner beneath the screen, the company had to ditch the headphone jack, bringing it kicking and screaming into 2018. OnePlus was one of the remaining few companies to take the leap. This time back in 2016, co-founder Carl Pei asked Twitter whether they supported keeping the headphone jack. The answer was overwhelmingly yes. So the company kept it. Two years later, however, a new innovation has forced the company’s hand. And OnePlus isn’t stopping there. Last week, we noted that the company has fully committed itself to bringing out a 5G phone in 2019, making it one of the first in the U.S. to do so. The next couple of years will find the company making a lot of difficult changes as it looks to expand while maintaining the core audience that helped it grow in the first place. 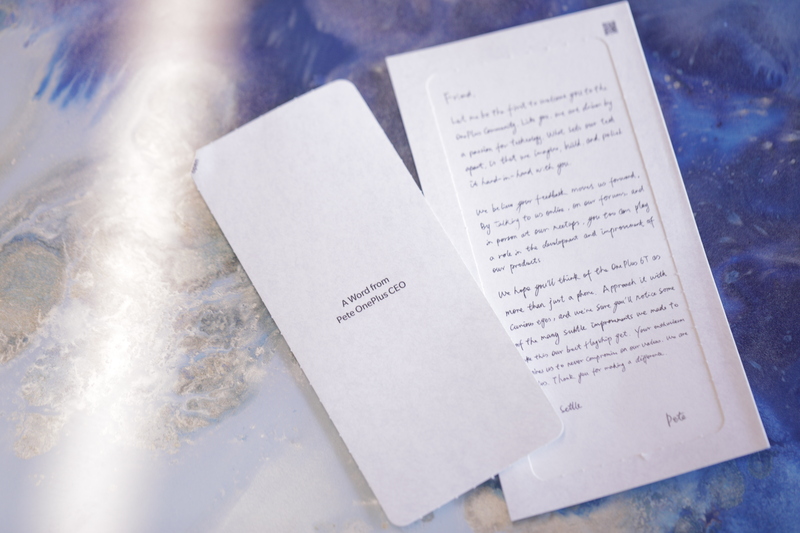 As a kind of small consolation, the package includes a note from Pei. It’s a nice little nod to OnePlus’s roots, though it tellingly opens, “Friend, Let me be the first to welcome you to the OnePlus community.” It’s an acknowledgement that the company is growing and also a promise not to betray its roots. We’ll see, I suppose. At 6.41 inches, the 6T has the largest display offered on a OnePlus device. 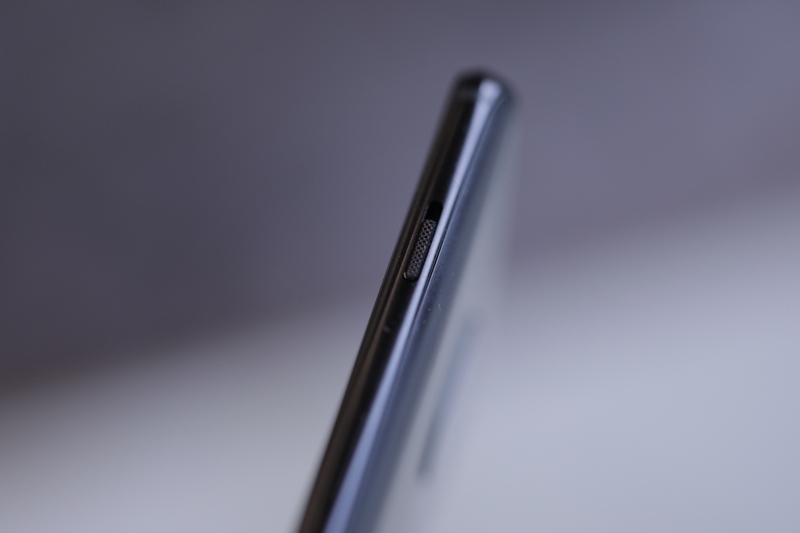 That’s helped along by the hidden fingerprint sensor, of course, along with a tiny notch up top. In spite of the excessively large screen, the phone itself doesn’t feel huge — especially after carrying the downright massive Google Pixel 3 XL around for a while. The design language is pretty standard OnePlus — and that’s a good thing. The company’s phones are solidly built and nice to look at, without focusing too much on the kind of flash that defines products like the Galaxy line. Inside, you’ve got a Snapdragon 845, 6 or 8GB of RAM and 128 or 256GB or RAM. Solid enough specs, particularly given the price point. The company has also beefed up the battery by 20 percent, up to a healthy 3,700 mAh. That will give you well over a day of use. The phone arrives November 1, starting at $549 — still the best deal in smartphones.